Another life hack – germ free train travel in Japan. Love it. I saw it on treehugger and discovered it doing the rounds, I am sure it will be on The Project very soon. Think of all the germs you come into contact with when you hold on to the rail or hanging thingy-ma-gig, think of the thousands of people that have used the touched it in the last 24 hours. 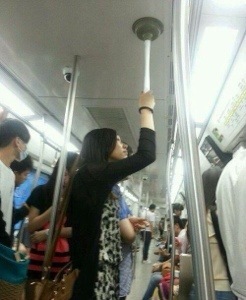 Well, now thanks to the old fashioned sink plunger your germ worries are over. All we need is an entrepreneur or inventor to come up with a telescopic or collapsible one that fits in your bag and voila germ free travel for all. ← Gr8 way that u can save the planet!